At Keyway Lock and Security, we provide high-quality security solutions for residential and commercial clients throughout Villa Park and Chicago. We maintain two well-stocked storefront locations where we sell safes, keyless entry systems, CCTV units, and specialized security products. We also cut car keys, program keyless entry fobs, and car remotes, and install replacement key fob batteries while you wait. When you call us, you can sit back, relax, and let us do all the work. We’ll source the right hardware, locks, cameras, and security devices for your home or business, complete all of the installation work for you and double-check everything to ensure it’s up to our high standards. We’ve been providing trusted locksmith services in Chicago and Villa Park since 2008, and during that time we’ve successfully tackled every type of situation you can imagine. We’ve responded to car lockout emergencies that involve a child being accidentally locked inside a vehicle, helped homeowners gain access to their house after losing their keys while on vacation, and even opened up antique safes for estate trustees. No matter what your lock and security needs are, you can be sure that we can provide you with the solutions you need at a fair, honest price. We’re committed to your safety and security. All of our locksmiths drive clean, well-marked Keyway vans, wear our company uniforms, and carry clear identification so you can feel confident that you are dealing with a trusted member of our team. After all, you don’t want just anyone cutting keys for your office, programming your car remote, or installing a new lock on your front door, do you? Unlike some area locksmiths that only work on residential locks, we have the skills and experience needed to design, install, and maintain advanced security systems for commercial applications throughout Chicago and Villa Park, IL. Whether you need to secure sensitive files at your office, improve access control at your storage facility, or keep tabs on what happens when the boss is away with a CCTV system, you can count on our team of master locksmiths to provide you with a high-quality, reliable system that’s customized for your specific application. Whether you visit one of our security hardware stores in Chicago or Villa Park, IL, or you take advantage of our mobile locksmith service, you can rest assured you’ll be in good hands. Every member of our staff team is a licensed locksmith, and we carefully screen and background check each one of our employees for your peace of mind. Why waste your valuable time searching online for locking hardware, or worse yet, trying to find someone to help you at one of those big-box hardware stores when you can get all the advice you need right here! We’re honored to be named an Elite Service Provider by HomeAdvisor, which is reserved for professionals who go ‘above and beyond’ to earn 5-star ratings from our happy customers. We’ve also been hand-selected as a trusted automotive locksmith for GEICO insurance in the Chicago area. We’ve been accredited members of the Chicago Better Business Bureau since 2016, and we’re proud to have been awarded the highest-available rating from the BBB. If you’re looking for a simple way to keep your valuables protected, our team of safe experts is here to help. We are factory-authorized dealers for some of the top safe companies, including AMSEC, Gardall, and LockSAF, and we install all types of safes – including those super-cool secret wall safes! We can provide you with all the information you need to make an informed choice about selecting the right safe for your home, office, or retail space, and we even have the specialized skills it takes to replace old dial locks on safes with new, digital locking mechanisms. Want to level-up your home with Nest Smart Home products? All of our Chicago locksmiths are Certified Nest Pros – that means we have the specialized skills and expertise it takes to design and install a customized Nest Smart Home system in your home. We’ll explain all the various Nest devices, review what you’d like to do with your system, and install your choice of wireless cameras, smart locks, and video doorbells. We’ll also help set up your Nest app, and ensure you feel comfortable with your new smart home system. We Can Cut ANY Key With This Machine. Our key duplication service makes it easy and convenient for you to always have a spare set on hand for your car, home, garage, or rental property, and our licensed locksmiths ensure that your new key is cut right, the first time. 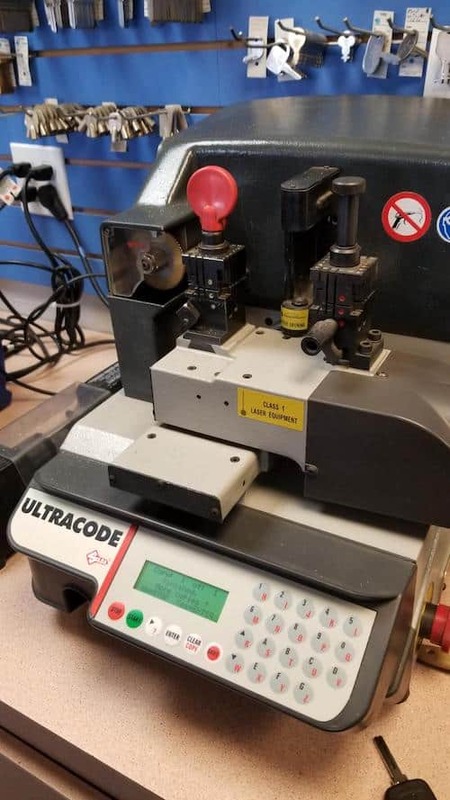 We have thousands of keys in stock, and we can even duplicate master keys, tumbler keys, padlock keys, and automobile keys that require programming to work with your car, van, or truck. At Keyway, we love to say ‘thanks’ to our valued customers by offering special discounts and coupons on our products and services such as car remotes, chip head car keys, and mobile service calls. To find our latest offers, click here. And for all your locksmith needs in Chicago and Villa Park, IL, call us here at Keyway – we’re your local, full-service locksmith.